Since Portugal started to reveal Metal names, we finally saw the potential of the country. For those who know the Lusitanian Metal scene, many excellent names born in Portugal and deserve to conquer the world and in any Metal genre you could think of. Then, to see an international project like STAGMA being born there is not unexpected. Their first album, “Stagma”, is really an excellent work. To be honest, the idea of the band was born by the hands of Alex Santos, guitarist, producer and composer of SCAR FOR LIFE, and he joined forces with Joe Petro (from HEAVEN AND EARTH), Vinny Appice (the known drummer who worked with BLACK SABBATH and DIO), Neil Fraser (TEN, RAGE OF ANGELS), and Rob Mancini (SCAR FOR LIFE, BONEYARD DOG). The team plays a catchy and melodic form of modern Heavy Metal, with a fine balance between aggressiveness, charming melodies and catchy choruses, and all these elements permeated with a great and heavy musical weight. Even not being something extremely new, it’s creative and excellent. “Stagma” was mixed and mastered by Alexandre Santos, who did a fine work. The sound quality of the album is really heavy and aggressive as modern Heavy Metal demands to be, but with that essential clarity. This last feature allows us all to understand the songs and their musical arrangements without making great efforts. And the modern feeling comes from the instrumental tunes that were chosen. And the work of Zacarias d’Araujo on the art of the cover is very beautiful, fitting on the STAGMA’s music. All the songs are really great, hooking us all, but the bittersweet aggressive harmonies of “Pokerface” (the vocals are really fitting perfectly on the melodies, and the chorus is really seductive), the charming melodies of “Rocket Machine” (what charming guitars), the pure breed Hard Rock scent of “Faces in the Mirror”, the introspective, heavy and beautiful ballad “Gates of Valhalla” (the guitars’ arrangements are really fantastic, because they aren’t complex, but fills the song in a way that is perfect), “Sister Sister” with its accessible harmonies and great tempos, and the amazing melodies that fills “Written in Stone” can be said as their best moments. But once more: all the songs are really great, so listen the album from the beginning to its end. 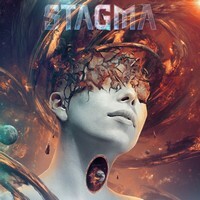 Be an addicted to STAGMA’s work, and hope that the last track, “To Be Continued”, is a statement that they’ll be back. Let me be honest: I just can’t wait!